Recently disclosed emails demonstrate that one of the few public figures to stand by Syrian dictator Bashar al-Assad during his brutal repression of anti-government protesters relied on Assad's help for his signature project. George Galloway, the founder of the British-based organization Viva Palestina (VP), sought Assad's help in August 2010 for VP's most recent convoy to the Gaza Strip. "Syria is as I have often said is the last castle of Arab dignity," Galloway wrote in an email dated Aug. 11, 2010 to Bouthaina Shaaban, a special advisor to President Bashar al-Assad. The initial email and subsequent correspondence between Galloway and Shaaban were leaked by the hacker group Anonymous and printed in full in an article that ran last Tuesday in the Israeli newspaper Haaretz. In the email, Galloway asked for permission for the convoy to depart from Syria's Latakia port for El Arish in Egypt. He referenced the "outstanding assistance afforded to us [VP] in Syria on previous occasions over the last period" and said, "I am writing once again to ask for Syria's co-operation although I do not doubt it for one moment." Galloway established Viva Palestina in January 2009, and has since led four land convoys to the Gaza Strip. Those convoys delivered millions of dollars to the Hamas regime in Gaza, and Viva Palestina has supported the designated terrorist group, both morally and politically. The fourth convoy, which the emails discuss, left London in October 2010 and has been dubbed Viva Palestina 5. In recent months, Galloway has remained supportive of Assad's government, despite the murder of civilians by troops loyal to Assad. For example, ignoring the numbers of casualties, Galloway said in an interview with Hizballah's Al-Manar channel in July that Assad was drawing criticism "because of the good things that he did such as supporting Palestinian and Lebanese resistance and rejecting to surrender to Israel." The former British MP has a long record of support for the Syrian regime, and has consistently supported the tyrant since VP's inception. During a November 2005 speech at Damascus University, Galloway called Assad "the last Arab ruler, and Syria is the last Arab country. It is the fortress of remaining dignity of the Arabs." "Syria," he said in a separate appearance that July, "is lucky to have Bashar Al-Assad as her president." Last March, prior to the wave of unrest that swept the country, Galloway offered a "theory" as to why an uprising had not yet reached Syria: "The Syrian regime is authoritarian, no doubt…" but "the government of Syria for a long time has pursued a policy of Arab-ness. Of Arab nationalism, of Arab dignity, of support for the Palestinian cause, material support, material support for resistance, rejection for the foreign occupation of Iraq. And a refusal to bow before the foreign powers." Galloway was critical of some of Assad's description of the situation last summer. In a statement posted on the "Socialist Unity" website in August, Galloway acknowledged it was "a gross distortion" to label the Syrian uprising the work of "terrorists" and "gunmen" as Assad had. "In fact the regime itself looks more and more like the terrorist, certainly the gunmen, in this picture. This is a genuine popular uprising taking place in Syria even if it is heavily infiltrated by all of Syria's enemies – the enemies of all the Arabs in my view." Yet to the Arab world, Galloway reiterated his same message of support for Assad's regime, while claiming that the West is "against" Syria. In an Arabic article that ran in the Syrian newspaper Alwatan in November, Galloway reportedly asserted that he is "with Syria and stands at its side and that he is against imperialist intervention." "[I] did not come to impose my words on Syria and I am not an agent of the Syrian government or any other government. The Syrian government has not given me anything in my life, but as you chose to stand against America during the invasion of Iraq, I stand today, alongside Syria." Galloway added, "The West loves dictatorship, The Al Saud is its best friend, but the West is against Syria and Syrian President Bashar al-Assad, because they refuse to sign a Treaty of surrender to the Zionist occupiers because Syria believes in Palestinian protection of their land, because they want to cut off the relationship with the Resistance and Sayyed Hassan Nasrallah, and because Syria maintain relations with Iraq and Iran" [Emphasis added]. Galloway has tried to play down his relationship with Assad but the August 2010 email exchanges between Galloway and Shaaban, Galloway's rhetoric, and VP's connections to Syria indicate otherwise. Although Galloway claimed in the August Socialist Unity piece, "Historically, I was never close to the Syrian regime…," he omitted the relationship Viva Palestina had with the government. Viva Palestina 5 was greeted by thousands of supporters – including government leaders - upon its arrival in Syria in early October 2010. Flags of the Palestinian Islamic Jihad, the Popular Front for the Liberation of Palestine, the Syrian Socialist National Party and Turkey were waved. Talal Nasser, the Hamas spokesman in Syria, welcomed the convoy. Several days later, Galloway and VP leader Kevin Ovenden led a convoy delegation to Damascus, where they held a media conference and met with Hamas leader Khalid Mishaal. The convoy, including over 350 people and 140 vehicles, stayed in the port city of Latakia, Syria for more than a week before proceeding to Egypt, due to delays stemming from Egyptian authorities. "The support of the Syrian authorities and others has been vital in the successful negotiations [with Egypt]," Viva Palestina's website states. 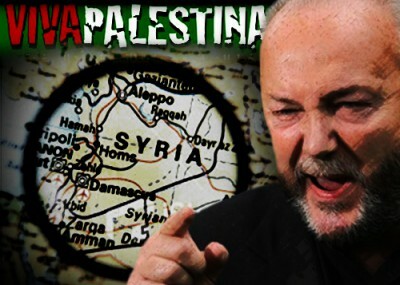 Galloway also received help from the Assad regime during Viva Palestina's third convoy to the Gaza Strip, which left London in December 2009 and arrived in Gaza in January 2010. The Syrian government provided aid and vehicles, and the convoy made a stop in Syria where it received a warm welcome and accommodations paid for by the government. While in Jordan, the convoy was informed that the Egyptian government requested that it return to Syria, put all of its vehicles on a boat and sail from Syria to the El Arish port. The Syrian government arranged for a charter plane to fly over 500 convoy members to El Arish. Similarly, Galloway has maintained contacts with other dictators and extremist leaders and groups in the Arab world. The Investigative Project on Terrorism has previously exposed Galloway's and Viva Palestina's extensive ties to, and support for Hamas and other terrorist organizations, including Hizballah and the Palestinian Islamic Jihad. Galloway's next VP operation is Viva Palestina Arabia 6, "The Right of Return Convoy," which is slated to depart London in late April and arrive in Gaza on May 15. How The Hitch would have enjoyed this further fall into an even level lower of public disgrace of one of his arch enemies.